This covered patio in Austin is full of angles and it looks great from each one. This covered patio in Austin looks great from every angle. When you think of a covered patio design often times your mind will automatically picture a square structure under a hip roof. The fact of the matter is that our covered patio designs don’t fall into a generic, cookie cutter style. Many times your ideal design and roof type can be something quite different and unique. When we design an outdoor structure area that is connected to, or in close proximity to you existing home we consider all the factors that keep the design original to your home’s materials and structural details. The octagonal roofline of the patio cover adds as much beauty to the inside of the structure as it does the outside. 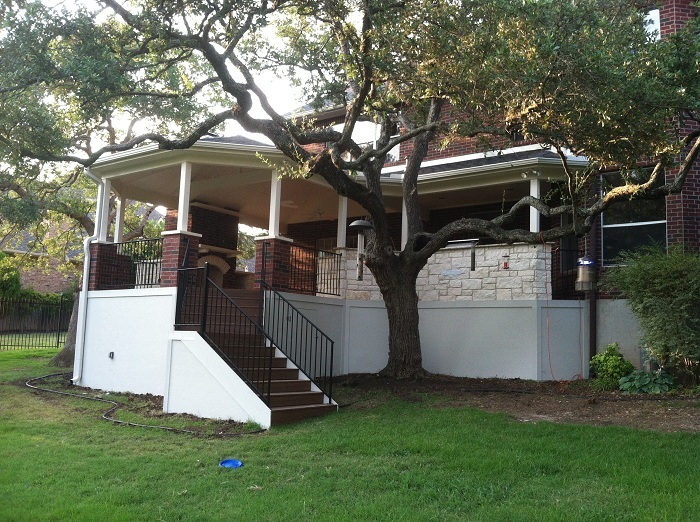 We recently completed a project in Austin that takes the covered patio to a whole new level. This covered patio includes an outdoor kitchen, an outdoor fireplace and abundant space all under an octagonal roof design. This type of roof is often used when building gazebos and when used as a covered patio roof delivers dramatic beauty evident from the backyard as you look up to the structure and on the interior on the structure as you look at the interior ceiling of the patio. 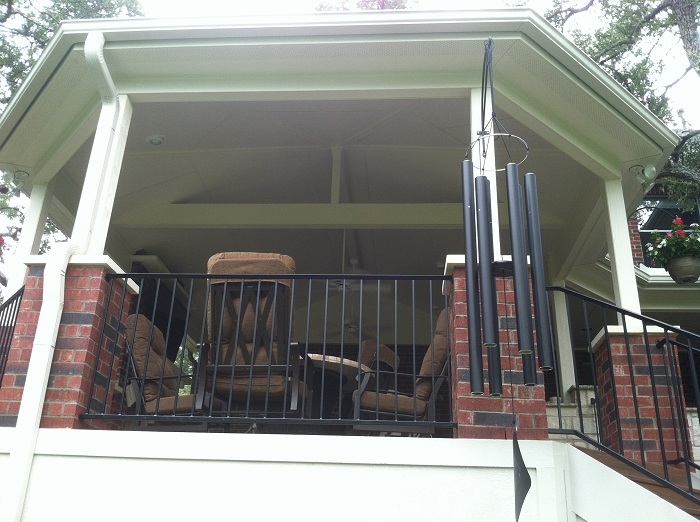 We also used a king-truss which spans the width of the patio and serves as much for aesthetic appeal as for support. The result is stunning. Not only does this covered patio feature a unique roofline, it is also packed with every luxurious amenity that you can get in a covered patio design. We detailed the extensive use of high-quality materials in our last post by Archadeck of Austin, the materials combined with the space this area offers the homeowners takes an otherwise vacant space and creates the feel of an outdoor family room. The brick and white limestone fireplace expanses plenty of room for comfortable outdoor furnishings to surround it so this family can curl up by the fire any day of the week. Above the fireplaces’ mantel we pre-wired the conduit through the fireplace so no wiring is visible to the naked eye for the homeowners to mount their flat-screen TV. The large gourmet outdoor kitchen gives them the freedom to leave their indoor kitchen any time they like and prepare and dine together outside on their new covered patio. We included plenty of lighting and ceiling fans in the design to make sure no creature comfort was left behind. The space also offers endless entertaining possibilities because of the amenities and spacious square footage contained under roof. 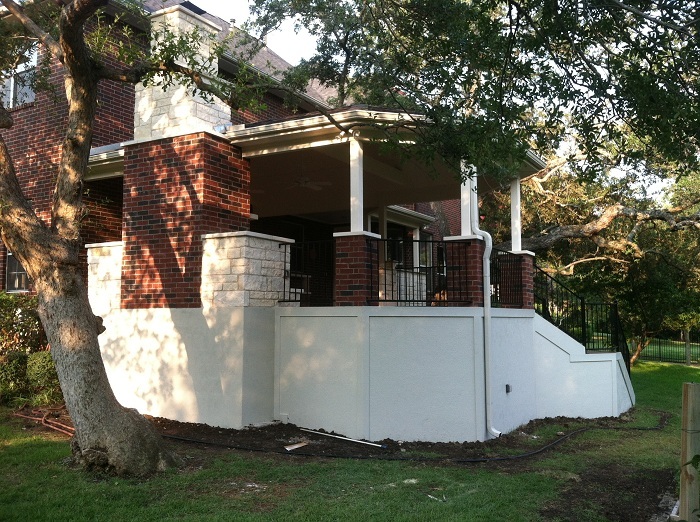 This image shows all the elements working together; the stucco skirting, brick, limestone and even the custom iron rail. From the backyard the covered patio is a design masterpiece, from the custom iron staircase that spills gracefully into the beautifully landscaped backyard to the stucco finished skirting used around the base of the covered patio to give it a finished look that ties it into the existing home perfectly. The image that comes to mind when I see the completed project is a photographer searching for the “best angle” to photograph a shot of his subject. This covered patio is full of angles and it looks beautiful from every one of them. This space delivers everything you would want in a covered patio design; harmony, functionality, cohesive tie-in to the existing home and it also increases the value of the existing home with the added outdoor living space. To see more stunning covered patio designs you can visit our covered patio photo gallery located on our website. You can also visit our outdoor fireplace and fire pit gallery as well as our outdoor kitchen photo gallery for endless inspiration for your outdoor endeavor. This entry was posted on July 30, 2012 by austinporchandpatio. It was filed under Austin patio cover, Covered Patios, Patios, Uncategorized and was tagged with Archadeck of Austin, Archadeck of Austin design, Austin covered patio, Austin custom covered patios, Austin Limestone outdoor fireplaces, Austin octagonal covered patios, Austin outdoor room, Austin patio builder, Outdoor kitchens Austin TX, Unique patio designs Austin TX.